So this was my first time running Reading half… Having grown up in Reading, it was great to return to my old stomping ground and the streets I once knew well. It brought back a lot of good memories of shopping trips and nights out! I was very impressed with the organisation here, particularly with regard to the number of portaloos, always a plus as I do like to use these facilities several times before a race (maybe this is too much information!?!) The baggage area was also very well managed with no delay at drop off or collection. The added bonus of a changing area was a revelation, particularly as it was cold and windy for much of the morning – this meant I could get changed pre and post race in relative comfort. When I signed up for this half, I wasn’t sure how fast I could go, so had opted for the green wave (2hrs). 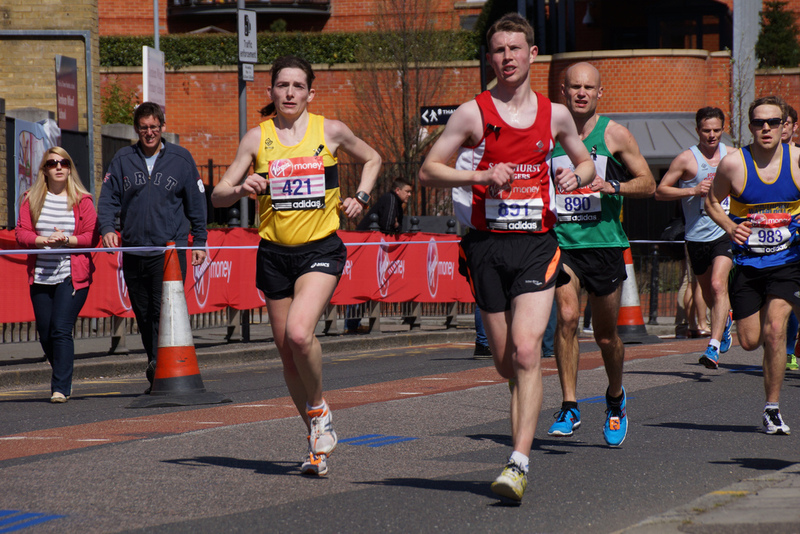 Having since done Farnborough half, I was hoping for 1.45, but I always tend to start further back in the field so that I can get a mental boost from overtaking people, so I positioned myself just behind the 1.55 pacer. This seemed to work well for me, although I do wonder whether I would be better to start further ahead next time for more PB potential! The race itself was really enjoyable; the crowd support and music at various points was a big motivator, I found myself inexplicably speeding up whenever there was music! This was particularly true coming down under the IDR towards the oracle, where I happened to see Jackie Kent for a brief hello – the steel drums sounded amazing! And I loved high fiving the children along the route, this put a smile on my face, especially whilst running up that first hill into Whitley, and in the latter stages of the race. I think I was smiling for most of the race! The final stretch down and into the stadium were fantastic!! Some more music and that moment when I felt like an athlete running towards the finish line gave me the energy for a sprint finish! !